For the full golf experience, it’s hard to beat Paradise Pointe Golf Complex in Smithville. Paradise point is unique in Kansas City for having two 18-hole golf courses, plus a four-hole practice course. The two courses are built along Smithville Lake, offering not only sweeping views of the lake but several holes where water lines fairways or surrounds greens. Just as the courses are memorable, so is the pro shop. Paradise Pointe prides itself on having the largest and most varied selection of fitted clubs and other golf equipment in Kansas City. Paradise Pointe is also set up to host large golf events, with a 4,000-square-foot banquet room for post-golf activities as well as wedding receptions, reunions, large parties or public presentations. The person at the controls at Paradise Point is Eddie Hall, general manager and director of golf. He has for many years held the contract with property owner Clay County top operate Paradise Pointe. Hall has a simple way to measure whether Paradise Pointe has a winning model: people come back. 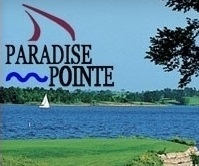 Paradise Pointe, at 18212 Golf Course Road in Smithville, opened in 1982 with the completion of the Posse. In 1994, the Outlaw opened adjacent to the Posse. The course names derived from Jesse James, the outlaw who had lived in Clay County. Both courses have rolling, wooded terrain. The Posse is more compact while the Outlaw is links-style, with a front nine that does not return to the clubhouse. Each course is a par 72. They are both about 6,500 yards from the back tees and there are four tee boxes. Both courses are walkable. While the Outlaw has slightly higher course and slope ratings, Hall says scoring is roughly the same on each course. The signature holes are those along the water. Especially memorable is the 4th on the Posse, where the fairway borders the lake on the left and the green is on a peninsula. The next hole, a par 3, requires a tee shot over water. Water borders the left of the 9th hole on the Outlaw, almost surrounds the green on 10 and runs along the 11th. The Outlaw has zoysia grass, the Posse bluegrass. The dry summer has taken a toll on area golf courses but Paradise Pointe benefits from drawing its water out of Smithville Lake, Hall said. The woods and water that surround Paradise Pointe make it popular with wildlife. Golfers commonly see deer, wild turkey, bobcats and variety of birds on the course, Hall said. Paradise Pointe, about 20 minutes north of downtown Kansas City, not only draws players from the metro area but from other states, especially ones to the north such as Nebraska, Iowa and Minnesota, Hall said. Golfers like being able to play two courses at the same location, especially if they come in from out of state, Hall said. The four-hole Academy course for practice has proved popular, Hall said. It has two par 5s, a par 3 and a par 4. Golfers can practice a variety of shots long and short. It’s popular with beginners and experienced players, Hall said. With its banquet room and dual courses, Paradise Point pulls in more than 100 tournaments per year, Hall said. Charitable or corporate outings for groups of 16 to 144 players or more can be accommodated. In the clubhouse, Paradise Pointe continues to have a wide range of golf clubs and other equipment at a time when many other courses have given way to big box stores by trimming their inventory. “We are not cutting back and we are very competitive on price and selection,” Hall said. The club has periodic sales, including a customer appreciation sale in October. Hall fits clubs using the latest technology to find the best length, shaft stiffness and loft for particular players. He observes players hitting on the range to do the fitting. “The best thing about our clubs and the reason people keep coming back is they do not hit into a net during the fitting,” Hall said. Customers and Hall can observe the shape, trajectory and length of various clubs in a way not possible when hitting into a net, he said. “A lot more people today understand the need to get fitted for clubs rather than to get something off the rack,” Hall said. Hall said there is a continuing trend in what players want most out their clubs. Information the golf course, green fees, leagues, memberships, lessons and social events can be found at paradisepointegolf.com or by calling the pro shop at 816-532-4100. The next time one of your out-of-town buddies tells you that Kansas is flat and boring, take him to Tomahawks Hills Golf Course in Shawnee. The 5,978-yard course (from the blue tees) is more like two courses played at different elevations. The course is still in Kansas, so we’re talking about differences of a few hundred feet, but there’s a definite separation. With numerous hidden greens and sloped fairways, the par-70 course is challenging but fair. The challenge mostly revolves around the uniqueness of almost every hole. Many of the visible greens are crowned, making perfect approach shots almost necessary. Tomahawk Hills challenges you right from the start with a 550-yard par 5. It’s a straight hole with big trees on both sides that make the fairway seem narrower than it really is. A par-3 second hole and a par-4 third hole lead you to an apparent dead end. But after a sizeable climb up the hill, you’re on the “second course” for the rest of the front-9. Well, most of it, as you’ll leave the upper portion on your tee shot on No. 9. Hole No. 4 is a simple 410-yard par 4, followed by a reachable 269-yard par 4. The challenge on No. 5 is that you can’t see the green from the tee box and there’s sand around the green. Do you blast away and hope you’re straight, or do you lay up for an easy approach shot? Welcome to Tomahawk Hills. A deceiving uphill par-3 plays longer than the 141 yards listed on the scorecard for No. 6, followed by the second par-5 on the front nine, a straight, narrow 476-yarder with trees tight on the left side most of the way. No. 8 is another par-4 that appears reachable, but your tee shot must be crushed. The 315-yard measurement is as the crow flies, but the terrain goes downhill before it goes back up, with the green a little higher than the tee box. It’s a fairly safe hole, however, as the fairway is wide and the rough is spacious. The tee box at No. 9 allows you to see the green and the landing area in front, but very little in between. You’ll start at nearly the highest elevation on the course and if you land it properly you’ll be at nearly the lowest. The 194-yards plays more like 164 as gravity adds to your drive. The sister green of No. 18 lies to your left, giving you plenty of landing area. There’s plenty of distance between the 9th green and the 10th tee, giving you a chance to see the refurbished clubhouse. Tomahawk Hills, built in 1910, is the oldest golf course in the Kansas City metro area. But the clubhouse—the only “house” on the course—was redone in 2011. Tomahawk is owned by Johnson County Department of Parks and Recreation, which also owns Heritage Park Golf Course in Olathe. 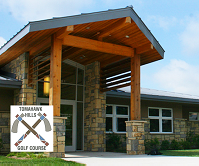 Tomahawk’s clubhouse is a modern facility that has a banquet room, lounge, dining area and large wrap-around front porch that overlooks the 9th and 18th greens and practice area. Just like the front nine, the back nine starts with a challenge. No. 10 is just 365 yards, but a creek running through the fairway about 200 yards off the tee, and plenty of rough and trees, force you to make a tough decision right away. If you choose the driver, you have to hit it perfectly to avoid trouble. If you lay up but stay too far right, you’ll have to hit over a large group of trees to a hidden green. Another uphill par-3 follows and plays longer than the 170 yards on the scorecard. With a big drop-off to the left and out-of-bounds to the right, the only choice is straight, which is easier said than done. Holes 12 and 13 are both par-4s with slight bends to the fairways. No. 12 turns slightly to the right going steadily uphill, while No. 13 bends back to the left on another reachable par-4. The 282-yard hole is another one where the green is not visible from the tee. Reachable is in the distant past as the next two holes are dueling par-5s, the only two on the back nine, another unique feature of Tomahawk Hills. No. 14 is 533 yards straight east, with plenty of trees on the right. No. 15 heads back straight west for 539 yards. Multiple elevation changes make No. 15 particularly difficult. After those exhaustive twin holes, a pencil-thin, 185-yard par-3 requires a straight shot to avoid ample trouble. Scattered trees to the right are more appealing than the thick woods to the left. As you’re putting on another crowned green on 16, you can’t help but notice the fairway of hole No. 17 to your left. The portion of the fairway that’s visible looks more like Turn 2 at Talladega than a fairway in Kansas, but the hole is one of the more unique designs in Kansas City golf. The hole is listed at 405 yards, but if you want to live dangerously and go over the trees, you can leave an easy pitch to the green. Of course, you can only see about 200 yards off the tee, so you have to be good and lucky to find your drive if you choose to live dangerously. If your adrenalin is not pumping after finishing 17, No. 9’s evil twin awaits. No. 18 allows you to see the flag—barely—but even less than No. 9 short of the flag. At 197 yards, it’s not impossible to have a really good shot. My playing partner was three feet from his first hole-in-one. But if you’re off-line, as I was, you’ll have some adventure finding your tee shot. The staff at Tomahawk Hills, led by Lispi, has done a great job of keeping the old girl looking fresh and inviting. Take the time to visit, just west of Interstate 435 on Midland Road.